This is one of the hoary chestnuts of clinical surgery, and the usual academic list for students can still be a problem after some years of practice. Obstructive appendicitis can give the same episodic pain and make the patient roll around and vomit frequ ently as ureteric colic, and occasionally I get an IVP done. About 3 years ago a very very fat teenage girl got sicker and sicker for a couple of days after I removed her appendix laparoscopically for Right abdominal pain. Only some “fishing for a diagnosis” with a CT scan clarified her right renal pyonephrosis wit h an obstructing calculus mid-ureter. This was drained by the radiologists and later managed by the (helpful) urologists. 2. Irritable bowel in children who rush to school and whose parents don’t make time for bran or other fibre cereal, and for an unhurried bowel action. I mostly ask for details of breakfast. 3. Abdominal migraine – episodic RIF pain with fever, preceded by typical hemicrania and visual fortification spectra, which aren’t mentioned unless you specifically ask. For reasons I don’t understand, this responds to cycloheptidine for two or three wee ks, and doesn’t recur. It may also increase appetite and unwanted weight gain. 4. Neuropathy: The cutaneous nerve which emerges through a neurovascular hilum at the lateral edge of the right lower rectus abdominis can be damaged or irritated by scarring from an unco-ordinated muscle contraction during some awkward movement. The RIF pain comes in spontaneous bouts lasting hours or days, sometimes with vomiting, which puzzles me. There is localised tenderness which persists when the abdominal muscles are tensed, and a milder pain is reproduced consistently by some trunk movements. These signs are abolished by accurate infiltration with local anaesthetic with the muscles tensed to help define the layers. Longer relief occurs (sometimes needing a second injection), perhaps because the scar is disrupted by the distension so that a neurom a is no longer squeezed. Once every few years I do an open neurolysis at the point of emergence of the nerve, which is easy to sever. On one such occasion the pathologist reported traumatic neuroma. One female of 18 from some distance away had these features, but in the left iliac fossa and not the RIF. To her amazement I asked if she was left-handed. To my surprise and satisfaction she said yes. I think this condition is due to an awkward heavy move ment with the dominant arm. 5. Others – threadworms, foreign bodies in appendix, foreign body perforation of nearby ileum, torsion of small tongue of omentum etc etc. There’s more to say, but I’m more interested in the differential diagnoses of others. 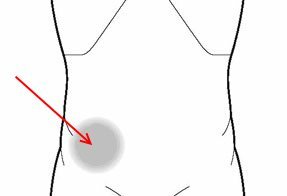 About 30 year old white female admitted twice in 1 week with right sided abdominal pain, nausea and vomiting, each time appeared dehydrated, but had not other signs to localize problem, pain on pelvic exam, heavy frequent disabling periods, previous appendectomy. In hospital about 2 days, rehydrated, symptoms improved but took a lot of IV fluids to maintain adequate urine output–patient was well hydrated before kidney sonogram. Back within 3 days, same symptoms, incapacitating nausea, vomiting, right sided abdominal pain, wants everything surgically corrected at one time–her mother says she is sure her gallbladder has been bothering her for a long time and her periods are incapacitating. So, I did cholecystectomy with cholangiograms, total abdominal hysterectomy with right salpingo-oophorectomy and then as always with pelvic surgery, checked her ureters (usually I just check them within operative field, but for some reason continued to follow the right ureter up behind the cecum (previous appendectomy) and found that the ureter above the base of the appendix was dilated to the size of normal ileum with normal small ureter just below this–no palpable stone)–after I exposed it, I called the Urologist to look. He said just dissect the area out. I did this, the ureter contracted and all shrank to normal size. It is hard to tell what caused this ureteral obstruction with acute symptoms–the obstruction was right at the appendectomy operative site, but she did not have symptoms until recently. The patient’s urine output was much better after surgery. Her nausea, vomiting and abdominal pain went away. Her creatinine came down. She was very happy.